This premium assortment contains an impressive array of gourmet goodies and fresh, juicy fruit. A wicker basket will be hand-delivered to their door filled with savory snacks, such as crackers, jams, cheese, coffee, and cookies. We then accent the entire basket with the freshest available fruits, such as apples, oranges, bananas, kiwi, and more, depending upon the season. Combined, the fruit and gourmet choices will make a lasting impression of your generosity and consideration. To ensure freshness, pictured components may vary according to location and availability. Premium Basket is a hand delivered gift. These gifts are delivered by one of our local design centers located throughout the United States and Canada. Same day delivery is available for most gifts when ordered before the cutoff time. The cutoff time for Premium Basket is 1 PM in the recipient's time zone. 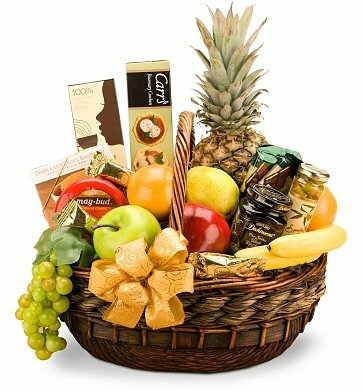 I sent the Premium Basket to a relative who had been hospitalized. Upon receipt of this beautifully packaged basket, I received a hearty Thank You from my relative. I was told that the fruit was not only delicious, but simply gorgeous and eye appealing (bannas golden brown -- not a hint of green or black). The relative could not decide which to eat first. The basket held a variety of item (including nuts, candies, and different fruits). I am an out of towner, and will always use this Company for future gifts. We were pleased with GiftTree's same day service and help provided by the representative. I have used them to send gifts several times and have not received a negative comment from the recipients. Upon delivery, the recipient who had it tough and needed a lift said "If you weren't such a reprobate, I would marry you!" High praise from a lifelong friend and the florist deserves more than passing credit. Thank you for making such a beautiful gift basket. My friend had been confined home and couldn't get to the store. I thought this would help. She loved it. The fruit was fresh and delicious. Thank you again. Better than expected by far! I have sent many food baskets to many people from many different companies. I have always received thanks and compliments on the baskets, but i have never seen one personally. Recently i sent my mom this basket for her birthday, and she sent me an up close picture of her holding the basket. She is not easily impressed, but she raved about this basket! She said it was huge, beautiful, great variety, and delicious fruit. This is not my first purchase from GiftTree.com, and both times the recipients were overly complimentary and completely impressed with their gifts. In fact, since Gift Tree offers such a variety, i don't see any reason to go anywhere else in the future. I love this company but more importantly the SUPERIOR QUALITY of their items, which is a rare thing these days.